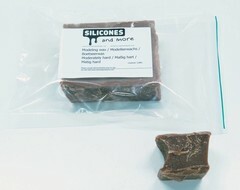 Scenography makes extensive use of silicone for mold making. Props are often made of silicone (hands, fingers, arms, wounds), but also of hard resins (eyeball, nails, windows, firearms, helmets). Again in some of these ranges fire safety is of importance. A fake bottle is quickly made with a silicone mold of a bottle and some sugar glass. Fake broken glass is easy to imitate with low shore clear silicone. 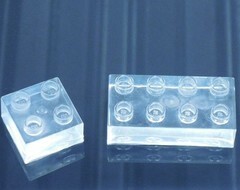 Limbs may be faked by using a strong colorless silicone which you can color easily like the Silicone A Transparent 15. An (eye) lens is made from clear epoxy and a gun is normally made of black colored hard PU. Gilding Wax €8,95 With the Gilding Wax you can give an art piece/object made from porcelain plaster or acrylic resin a beautiful old metallic look. Paint your object black and rub the Gilding Wax gently on the surface. Plaster bandage €11,95 Plaster bandages to make support hulls for (alginate) molds. Silicone Addition Clear 25 €29,25 A silicone Clear 25 Set is a two component addition curing silicone that results in a crystal clear clear silicone rubber. 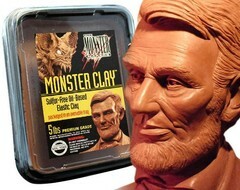 Wax Modeling Wax Medium Hard €9,75 Modeling wax Medium Hard is a modelling wax that works well at room temperature but does not sack quickly at elevated temperatures. Epoxy support cover €47,50 Epoxy support cover is a two component epoxy system, filled with carbon fiber. 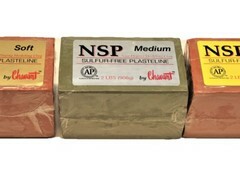 This product is used to support flexible moulds. Silicone Addition Clear 5 (very soft) €34,50 A silicone Clear 5 Set is a set of two component addition cure silicone that very clear slightly yellowish silicone rubber.